Those called to serve at the altar are to “assist the deacon and to minister to the priest…to attend to the service of the altar…in liturgical celebrations, especially in the celebration of Mass.” This ministry is open to young people beginning in 5th grade though the end of High School. Adults and families may also volunteer as Mass Servers. The role of the Lector in the Liturgy of the Word is crucial. Lectors assist in the mission of the Church, which is to preach the Gospel to the whole world. Thus, the Ministry of Lector is the key Lay Ministry in the celebration of the Eucharist. As the Lector proclaims the Word of God, God Himself speaks to His people. Ministers of Hospitality welcome people to the church at weekend Masses. They represent the intent of our parish community to welcome and embrace all who come to share prayer. It is part of our effort to become a more welcoming parish. The goal is to make sure that nobody enters through our church doors without being welcomed by someone. If you consider yourself to be a friendly and welcoming person, whether you are single, married or have a family with children, we need you! Ushers take up the collection, seating late comers, and recruiting volunteers for taking up the gifts. More importantly, this ministry is to be “the Hands of Christ [extended] to the living Body of Christ,” – opening doors, smiling a greeting, lending assistance to those in need. Sacristans provide the vital service of preparing the sanctuary and church for the celebration of the Eucharistic Liturgy, and assisting the deacon and the priest as needs arise. Volunteers take soiled linens (soiled with remnants of the Precious Blood and Sacred Host) home for laundering and ironing. This may include purificators, corporals, hand towels, albs and/or altar cloths. 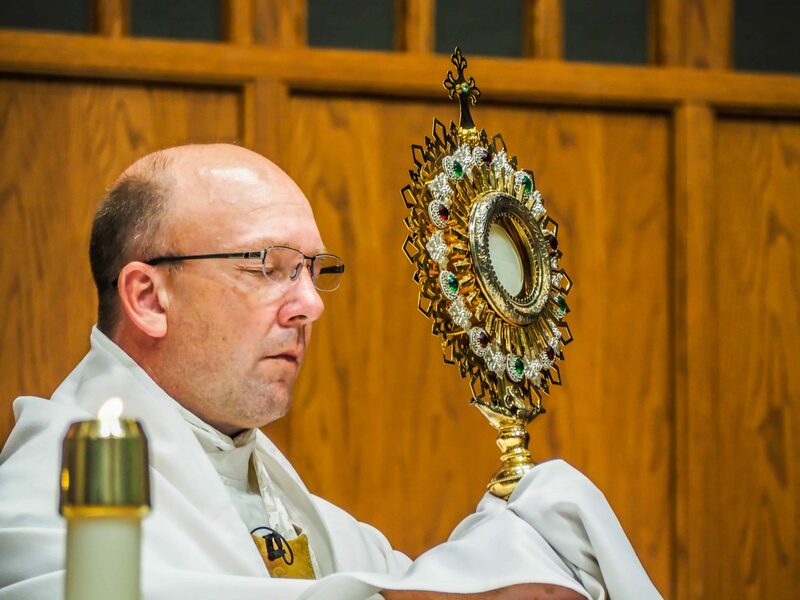 Everybody is welcome to stop and pray anytime during Adoration hours, although, we need committed individuals who can commit to one specific hour each week to watch over the Blessed Sacrament. Have you ever longed for a VERY, BEST FRIEND; someone with whom you could share your heart and soul? Someone who could understand and know your thoughts, feelings, and desires and not judge you? Someone who could share your joys and sorrows completely? This kind of friendship extends beyond the limitations of any human relationships and is found only with God. In our friend and family relationships, we want to spend quality time with those we love. Spending time with God during Eucharistic Adoration, shows God we love Him enough to spend quality time with Him. By asking God to be with us throughout our day, guiding us in all we think, say, and do, we are giving Him the opportunity to bless our day abundantly. Our parish has a wonderful gift in giving us the opportunity to spend time with our loving and generous God in Eucharistic Adoration! If you have never come to spend some quiet, quality time with our Lord, please consider coming once. Whether you’re able to stay for 5 minutes or 30 minutes or 60 minutes, you’ll find your time was not wasted! God WANTS to spend time with us as much as we NEED to spend time with Him! As a sub-committee of the Liturgy and Worship Committee, this faith-filled group is dedicated to the set-up and decoration of the Church environment in order to enhance our Eucharistic celebrations for the various Feast Days and Seasons of the Church year.